Brittany has been traveling the world like a wild woman sharing some amazing adventures and we absolutely loved her responses to our #wcw interview (and you will too). Brittany started Wild Woman Strong, which is getting kicked into gear (she just launched with an awesome 5-day Journaling Workshop) and we are super pumped to see more! She's a lover of journaling, captures some seriously incredible images, is originally from Chi-town, although she currently lives a nomadic lifestyle, and is passionate about connecting with other women, helping them discover and cultivate a life of self-care and an unapologetic self-love. This woman is pretty awesome in our book and we can't wait to collaborate with her. Connect with Brittany and follow along with her adventures here! 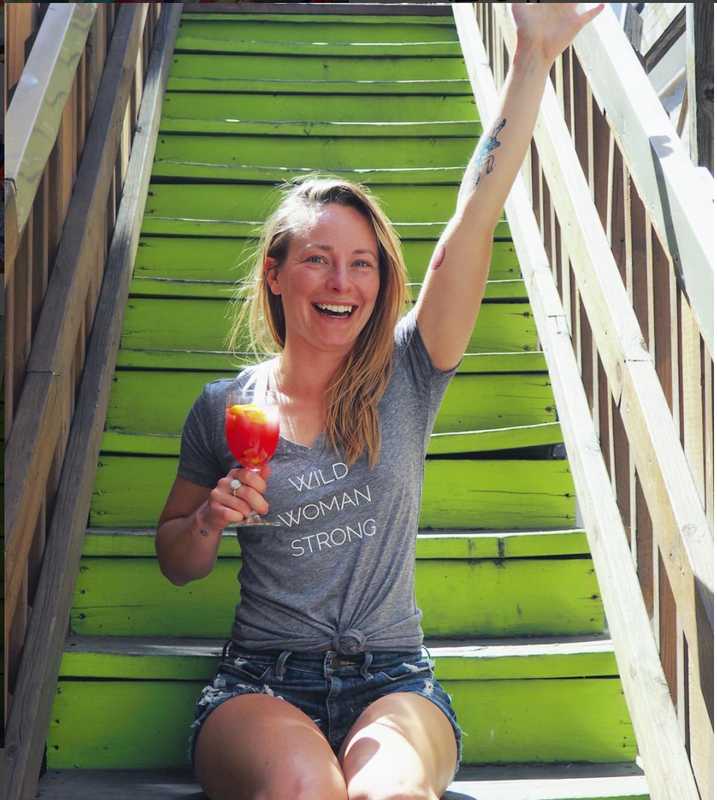 I am a nomadic strength coach + yoga instructor and founder + creator at Wild Woman Strong, where I share resources and tools for fostering a life filled with self-care and adventure. Coffee + Pizza, Barefoot + Adventures, anything that gets me outside of my comfort zone! I strongly believe that strength and resiliency are intimately connected and that strength isn't just a physical trait, but also a characteristic of one's mental and emotional being and that all three interplay with each other. The strongest people I know are those that are able to continue moving forward in the face of adversity or in challenging situations. My passion for helping women cultivate stronger and more effective self-care routines has come directly out of my experiences healing from a very low period of depression that was brought on by a lack of respect for myself and lack of methods and resources for taking care of more than just my physical health. Also from my experiences working with women in the gym, most of my clients were coming to me with weight loss goals, but it became very clear to me early on in my career that in order for my clients to see sustainable and long-term results that there were also changes that needed to take place outside of the gym. More often than not it was more than a case of just "eating too much" that had caused weight gain in the first place, and things like lack of self-confidence, putting others first far too often, or lacking the resources or knowledge for creating effective self-care routines were bigger culprits. Since my end goal is to give my clients sustainable and long-term results I wanted to create a space where I could provide them with a more holistic experience and more than just an exercise program. I have been nomadic for the past two years, meaning I don't always have access to the same spaces, equipment or types of workouts. In the past, I used to follow very structured kettlebell and mobility programming and rarely strayed from that method of training. However, once I started traveling full time I had to get more creative with my movement routine and following a strict program became challenging. Now, my focus is more on incorporating movement that allows me to best explore the area that I'm in and focusing more on the needs of my body in the moment. Walking has become a far more valuable movement to me because its my favorite way to explore new cities or areas, and since I tend to travel to a lot of places specifically to enjoy nature, activities such as hiking, kayaking, and rock climbing have become a more integral part of my lifestyle. Since I don't have consistent access to a gym anymore and don't follow any specific programming, when I am in the gym it forces me to be more in tune with what kind of movements my body has been craving. And of course the lack of consistent gym access has made my own body more valuable to me as a workout "tool", and I have really enjoyed getting more creative with how I use my body to create resistance or play with movement flows. As a grade A perfectionist and overly organized soul, learning how to just play with movement rather than having a structured program has been huge for me and has brought so much more enjoyment into the process, not to mention my body just feels happier too. I highly recommend that people try ditching the programming and equipment for a week and just play. See how many squat, lunge, or push-up variations you can come up with and note how different they feel for you and note how your body actually feels during the movements. If it feels good, do more of it. If it feels like crap, ditch it. Try getting upside down and play with some handstands or cartwheels or move your workouts to the playground and climb around a little bit. For me, fitness is anything that allows one to do what they want to do in their lives. I have so many clients that come to me with the goal of weight loss, when in reality their real goal is to be able to keep up with their children and play on the floor or run through the park, carry their groceries with more ease or just participate in every day life without feeling restricted and fitness is having the ability to do those things with ease. I hope that more and more people realize that there is no one size fits all approach to fitness. Movement comes in so many beautiful forms, none being better or more right than the others, and I hope that more people start to approach fitness with an explorative and open mind. Exploring different movement styles has been such an amazing way for me to explore my own physicality and mental strength and I am continually amazed by what my body can be capable of. Does movement increase your self-confidence? Hell yes! Exploring different movement styles has been such an amazing way for me to explore my own physicality and mental strength and I am continually amazed by what my body can be capable of. Not to mention, it just makes me feel good, both mentally and physically, and feeling good and healthy makes it easier to respect and love yourself for what you're capable of. What motivates the crap out of you? So many things! Coaching is probably my number one motivator - I am so fortunate that I get to continually work with people who are regularly getting outside their comfort zones and making positive changes in their lives. Seeing my clients overcome challenges and accomplish things they may have never thought possible before is such an amazing experience to be a part of and I get to witness these types of experiences regularly. Also, anytime I'm feeling in a funk or need motivation or inspiration, choosing to get outside of my comfort zone does wonders for helping me get inspired and motivated. That I'm not broken and never will be. I spent so much time trying to fix myself when the reality is that there was nothing to fix. Learning to love myself and appreciate my uniqueness has been a game changer for me.